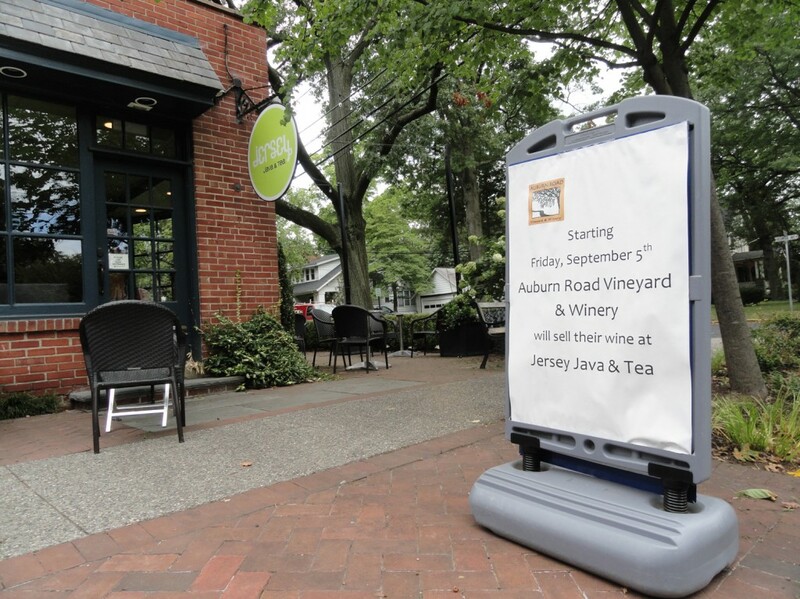 Jersey Java will carry the full line of wines from Auburn Road in its coffee shop, including six new blends that will ship in October 2014. Credit: Matt Skoufalos. With a state winery license in hand, the Haddon Avenue coffee shop became the first venue in the borough to retail alcohol since 1873. Jersey Java manager Ken Kouba said customer reactions have been overwhelmingly positive as Jersey Java opens its doors to wine-drinkers. Credit: Matt Skoufalos. When Jersey Java & Tea unfurled signage advertising its newest product, customer reactions were largely enthusiastic—even if some were a bit off the board. “We had one college girl come in and tell us it was illegal,” said Ken Kouba, who manages the Haddonfield coffee shop. Such reactions are natural consequences of becoming the first venue in the historically dry community to serve alcohol of any kind in nearly a century and a half. Yet on Friday, Jersey Java began retailing homegrown wares from Auburn Road Vineyard and Winery of Pilesgrove, NJ. The arrangement falls under state regulations passed in 2012 that allow New Jersey wineries to partner with as many as 15 separate establishments for offsite retail sales. The license does not allow Jersey Java to serve other alcoholic drinks, or even to mark up the cost of the Auburn Road wines, which are sold by the bottle, half-bottle, or glass. In short, it’s mostly an incentive for customers to patronize the coffee shop’s al fresco dining tables in nicer weather, to pair a cocktail with some of its menu items, or to relax with a drink before or after dinner at one of the local B.Y.O.B.’s in town. Kouba said that the inaugural weekend of wine sales was busy. As the first establishment to serve alcohol in Haddonfield since 1873, Jersey Java will be making a few changes to support the anticipated increase in traffic, including later weekend hours, a cheese pairing menu, and a formal launch event. 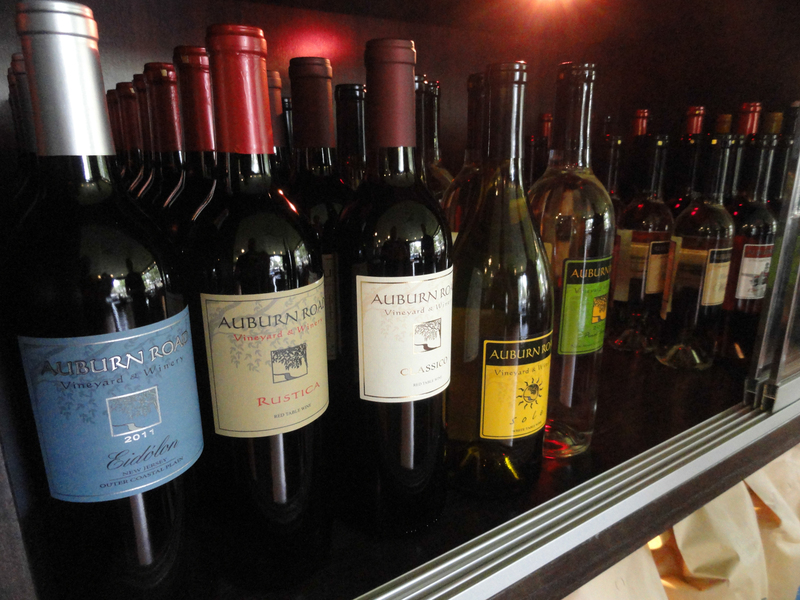 Presently, the shop carries the full list of Auburn Road wines, and will receive six new vintages to be released in the next month. Jersey Java had been working to develop a New Jersey winery partnership for some 15 months before striking a deal with Auburn Road Winery, Kouba said. “I like to pair up with vendors that are all about quality in local communities,” he said. “Quality is a real focus to them. Signage advertising the new wine retail sales at Jersey Java. Credit: Matt Skoufalos. Kouba said that the vintners at Auburn Road “don’t take themselves too seriously, which makes you judge the wines on their own merits. As for those surprised by the changing times in dry Haddonfield, Kouba said it’s a matter of perspective. “I think people put the focus on the alcohol instead of the wine,” he said.